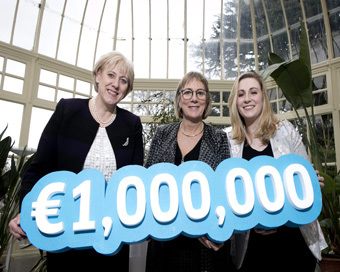 Enterprise Ireland’s €1 million Competitive Start Fund (CSF) for Female Entrepreneurs will open for applications on Tuesday, 1 May. Up to €50,000 in equity funding is available to a maximum of 20 successful female applicants with early stage start-up companies. Last year, 46 per cent of all companies who received CSF investment from Enterprise Ireland were female-led. Introduced in 2012 as part of Enterprise Ireland’s female entrepreneurship strategy, the dedicated fund is designed to enable companies reach key commercial and technical milestones which will ensure delivery of their product or service to an international audience. Enterprise Ireland’s Competitive Start Fund is funded by the Government of Ireland through the Department of Business, Enterprise and Innovation. The Competitive Start Fund for Female Entrepreneurs will close for submissions at 3pm on Tuesday 15th May. (Pictured (L-R): Heather Humphreys TD, Minister for Business, Enterprise and Innovation, Julie Sinnamon, CEO Enterprise Ireland and Fiona Edwards Murphy, CEO & Co-Founder, ApisProtect).